Just as standards were crucial during the first industrial revolution, over 250 years ago, they will also play a critical role in the fourth. The Fourth Industrial Revolution refers to the emerging technologies, which are blurring the traditional boundaries between the physical, digital and biological worlds. This increased connectivity of people and things will impact the way we produce, trade and communicate, much like steam power transformed production methods and the way of life of many societies during the first Industrial Revolution. In the 18th century, the transition from manual work to machinery and factory work raised the need for standards. For example, to replace machine parts and enable specialized mass production of components. Today, standards will once more play a key role in the transition to a new era. The speed of change we are witnessing would not be possible without them. Innovators rely on International Standards, like those produced by IEC, ISO and ITU, to ensure compatibility and interoperability, so that new technologies can be seamlessly adopted. They are also a vehicle to spread knowledge and innovation globally. The rapid pace of change brought by the Fourth Industrial Revolution has its challenges. Robots and artificial intelligence will take over more and more tasks previously done by humans, additive manufacturing (also known as 3D printing) will change the way we make goods, and give us the ability to “print things” at home, and as everything from planes to baby monitors are connected digitally, the vulnerability of data and the consequences of a breach are growing exponentially. These are only some examples of the issues presented by a new generation of smart technologies characterized by big data, increased integration, cloud storage and open communication of devices to name a few. International Standards are a powerful way to ensure safety and minimize risk. For example, security standards can keep our data safe and deter hackers. And safety standards for robots, will make it easier to interact with humans. The Fourth Industrial Revolution has begun, but in order to seize its full potential for the betterment of society, standards are needed. CONTEST: What’s your crazy idea?! Calling all creatives! Take part in the World Standards Day 2018 design competition! If you had the latest most innovative technology at your disposal, what problem would you solve? 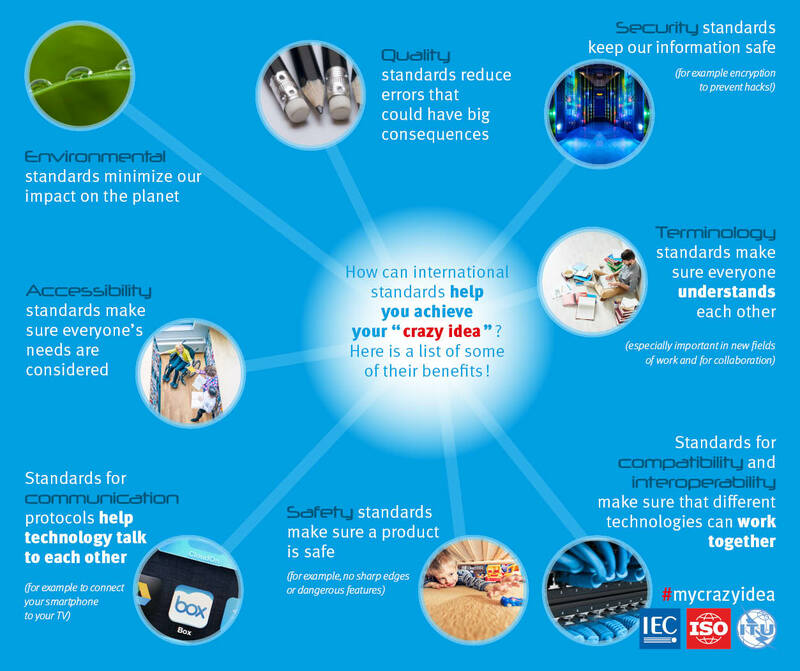 And how can International Standards help you? 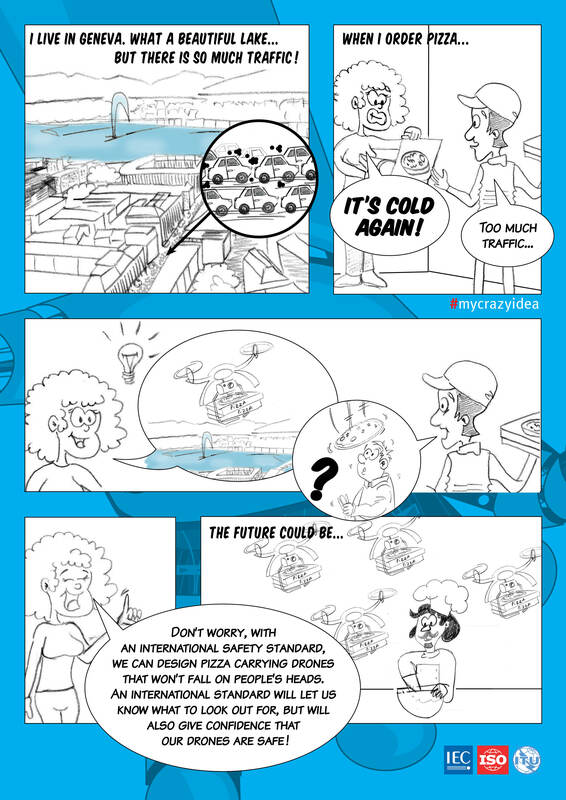 Draw, animate, sketch or design your crazy idea, and you could win up to 1500 CHF! Anyone from any country can participate! Submit your application by 17 August. A competition to celebrate World Standards Day. This year the theme is “International Standards and the Fourth Industrial Revolution”, which refers to the new technologies that are transforming how society makes and does things. These technologies are blurring the boundaries between the digital and the real world. Examples include artificial intelligence, 3D printing (additive manufacturing), the internet of things, etc. Think of a problem happening in your city/town/country that you could solve if you had access to the latest technologies: artificial intelligence, smart manufacturing, internet of things, 3D printing, virtual reality, etc. Dream big! Don’t be afraid to imagine how this technology could evolve in the future. But also think of what could go wrong! What challenges, safety or practical concerns will you face when putting this solution in place? Propose international standards (real or imagined) that could help solve some of these problems (just say what kind of standard it would be, for example, an information security standard, and what it does, for example, gives guidance for encrypting information). An example of what your submission could look like. 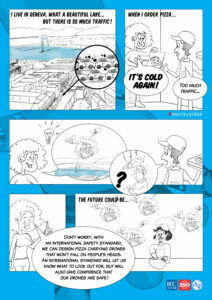 Draw / animate your idea showing: problem + solution + how international standards help. Anything from stick figures, to drawings, to digitally rendered design, or even a 30 second animation! Make sure to comply with all the rules here. To make things easier we have created 3 optional scenarios that can guide your story telling. Imagine that robotic and AI technology is very advanced. How could you use robots to solve a problem in your community? How could International Standards help reduce risks associated with using this technology? Or how can they make it work better? Imagine that it’s possible to connect almost any object to the Internet of things (for example your fridge could connect to your TV or your smartphone, your car, etc.). How can you use this technology for good in your community? What are the dangers, and how can International Standards help? In the future we may be able to “3D print” anything we want, easily and cheaply. How could this solve a problem in your community? How can international standards help reduce any risks and make this technology easier to use? Pick your favorite technology! Just make sure it’s something really innovative, and a little bit crazy (drones, mind-operating technology, wearables, biotechnology, telecommunications, electric vehicles, etc.) But don’t forget to tell us how International Standards can help make your idea work well. How do we pick a winner? Does the story provide a clear example of how an advanced technology (artificial intelligence, robotics, the Internet of Things, autonomous vehicles, 3D printing, quantum computing, nanotechnology, etc.) can solve a problem in a town, village, city or country? Is the name of the town and/or country clearly stated? Is the story told graphically? Any text should be in English. Are all the requirements and rules met? We like imagination, creativity and originality. Feel free to imagine what technology can do or will do in the future, rather than just what it can do now. This is meant to be a fun contest, not a scientific study!